Steve Jobs said people don't read any more. But Apple is talks with several media companies rooted in print, negotiating content for a "new device." And they're not just going for e-books and mags. They're aiming to redefine print. Some I've talked to believe the initial content will be mere translations of text to tablet form. But while the idea of print on the Tablet is enticing, it's nothing the Kindle or any E-Ink device couldn't do. The eventual goal is to have publishers create hybridized content that draws from audio, video, interactive graphics in books, magazines and newspapers, where paper layouts would be static. And with release dates for Microsoft's Courier set to be quite far away and Kindle stuck with relatively static e-ink, it appears that Apple is moving towards a pole position in distribution of this next-generation print content. First, it'll get its feet wet with more basic repurposing of the stuff found on dead trees today. I found this article via Fake Steve, who added more insightful (and entertaining, and, er, colorful…) analysis. A timely snapshot of Google, but I think there’s a theme more significant than the expanding Google-versus-Microsoft competitive landscape: Google and Microsoft are two companies striving to maximize the value-add (information, activity, and economic) potential of today’s Internet-centric communication, collaboration, and information management opportunities. In a classic capitalism case study, Google and Microsoft are forcing each other to focus on substantive innovation, contribute to and apply meaningful standards, and more. The short-term press/blogosphere/etc. fascination with the day-to-day competitive dynamics (e.g., event/announcement/press release choreography) is often interesting, but in many ways the competition and innovation are just getting started, and the next few years are going to be very exciting. So, the underlying theme, from my perspective, is about maximizing what might be called *VA (for information, activity, and economic value-add) in the increasingly Internet-centric world; the fact that Google and Microsoft are both focused on the same goal is in some ways secondary. Eleven years ago, Larry Page and Sergey Brin founded Google Inc. with a search engine and a plan. Now their company has grown into an online behemoth battling head-to-head with industry giant Microsoft Corp. while the term Google is a verb that means Internet search. Obviously, a lot has changed for the company and its founders since Sept. 27, 1998. This video is produced by the same firm that collaborated with Microsoft's Pioneer Studios on the previous clip, and it walks through a slightly different (and more conservative/realistic) iteration of the Courier interface. While the first video showed a handful of use cases, this one actually provides an overview of the interface and Courier's features, and more of how you would actually use it if you are not a designer. Microsoft Corp., in collaboration with the Federal Trade Commission (FTC), the U.S. Postal Inspection Service (USPIS) and Western Union, today launched a series of online public service announcements (PSAs) designed to help protect consumers from scams related to mortgage foreclosure rescue offers and promises of credit repair and advance fee fraud, also known as lottery scams. The search advertising-driven PSAs will appear on Bing, Microsoft’s new search experience, and will target consumers most vulnerable to these types of Internet crimes — putting valuable and trustworthy information directly into the hands of those who need it most. By including this information within the search experience itself, these organizations aim to remind consumers to be on alert at precisely the moment they may likely be faced with scams. Search Advertising PSAs in Bing Alert Consumers to Scammer Threat Online: Microsoft works with Federal Trade Commission, U.S. Postal Inspection Service and Western Union to provide financial scam guidance to people as they search the Web. But the most impressive feature on the Latitude Z may be the ability to check e-mail, calendar and contact information and to browse the Web via an instant-on software package. The software fires up the moment you open the laptop and connects right to a wireless network without Windows. Anyone who saw this weekend’s F-bomb “language malfunction,” on “Saturday Night Live” knows how unpredictably exciting live TV can be. Now you can experience that excitement for yourself, albeit without the threat of F.C.C. fines. A free Android application called Ustream lets you broadcast live video and audio from your phone to a Web site where friends (and strangers) can view it. BBC - dot.life: Who will ride Google's Wave? I knew that Wave was a collaborative tool that had caused a great deal of excitement when it was demonstrated at a Google developers conference in May. But it took me some time to puzzle out what makes it really different - and, despite its sheer cleverness, I'm still not entirely sure that it will take off. It's worth remembering too that not every Google product is a winner - for every Gmail, there's a Google Answers languishing in the outer reaches of cyberspace. Still, the proof of the pudding will be in what those 100,000 test users find to do with their waves. I hope to be among them, so will report back when I've given the tyres a good kicking. Threatening the president's life is a crime. The Secret Service said it regularly investigates threatening comments or incidents involving disturbing words or images of the chief executive. But officials also said that tasteless comments or idle bluster are probably not enough to trigger legal action. The agency seeks to determine whether the person who made the threats had some intent to carry them out or to otherwise incite violence against the president. Facebook members had their own quick response Monday. A second poll was launched asking whether the creator of the first poll should be arrested. The word “tablet” used to refer to a flat slab for bearing an inscription. Leave it to the tech industry to make it into something far more complicated and confusing. 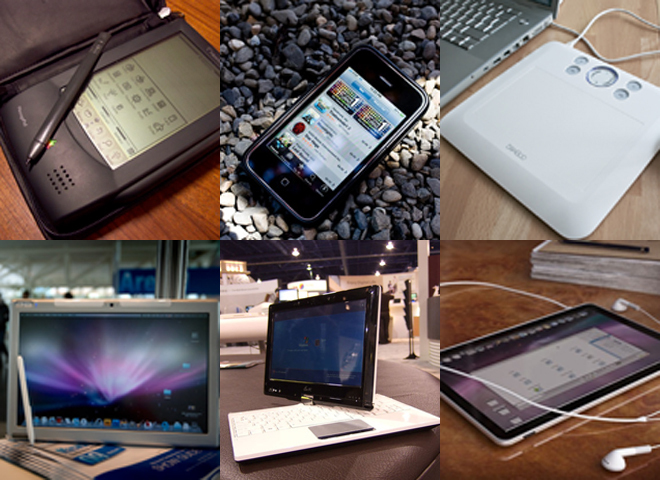 Scores of products marketed as “tablets” have come and gone, and now — with rumors of imminent tablet computers from Apple, Dell, Microsoft and others — the category seems ripe for a rebound. Facebook on Monday disabled a third-party application that asked whether users thought US President Barack Obama should be assassinated. Facebook and the US Secret Service said they were working together to investigate who published the poll, but a Secret Service spokesman declined to say whether they had located the author yet. It is against the law to threaten the president. The offending poll was created using an application that allows users to create their own surveys. “The vast majority were benign,” said Facebook spokesman Barry Schnitt. It went up at the weekend and came to Facebook’s attention on Monday morning, at which point they took it down. “We want Facebook to be a place where controversial ideas can be expressed,” said Mr Schnitt. There's been a lot of talk this year about finally charging readers for news, especially on mobile devices, where media executives see a chance to condition consumers to handing over a few dollars for a constant stream of updates to their pocket. CNN is among the first big news outlets to give it a shot. Its app costs $1.99 to download. The new app follows an announcement this month by News Corp. Chairman Rupert Murdoch that the company will start charging a subscription - possibly as much as $1 or $2 per week - for access to The Wall Street Journal's mobile applications. H.P. bills this software as a sort of secret sauce for keeping data centers running smoothly. Of course, as statements like those arrive from Ms. Livermore, H.P. continues to deal with the labor arbitrage issues. It’s in the midst of laying off 24,500 people, about half of them in North America, from the the old E.D.S., while hiring people in lower cost regions. Tchao, who rejoined Apple on Monday as vice president of product marketing, most recently served as general manager for Nike Techlab, where he oversaw creation of new digital products and services for fitness enthusiasts. Tchao spent 10 years at Apple, overseeing product marketing for the Newton and reportedly persuading former Apple CEO John Scully to including the company's handwriting-recognition technology into what would become Apple's first consumer device. The two tech giants are clashing over a $7.25-million contract to replace L.A.'s outdated e-mail system. The stakes are high enough that both companies have fielded teams of lobbyists and executives to press their case in City Hall. Microsoft Security Essentials, Microsoft Corp.’s new no-cost, core anti-malware service that helps protect consumers against viruses, spyware and other malicious software, will be available tomorrow, Tuesday, Sept. 29. Microsoft Security Essentials, independently certified by West Coast Labs, is backed by the company’s global security response team and is built on the same award-winning core security technology found in the company’s security solutions for businesses. It requires no registration, trials or renewals and will be available for download directly from Microsoft at http://www.microsoft.com/security_essentials/. Microsoft’s New Tool in the Fight Against Malware Free to Consumers: Microsoft Security Essentials, available for download tomorrow, provides real-time security protection. DisneyDigitalBooks.com, which is aimed at children ages 3 to 12, is organized by reading level. In the “look and listen” section for beginning readers, the books will be read aloud by voice actors to accompanying music (with each word highlighted on the screen as it is spoken). The so-called thin-client revolution has been touted before, but has so far failed to arrive. At last count about 633 million desktop PCs were humming in offices around the globe, according to technology watchers at Gartner. Gartner and other analysts say improved virtualization software for the desktop, the rising cost of maintaining PCs and demands for more security and regulatory accountability are all making conditions ripe for virtual PCs. Gartner says the number of virtual desktops doubled in the last year to about 600,000. It predicts that over the next five years, 15% of current PCs will be replaced by virtual desktops. Microsoft's Silverlight rich media plug-in technology for Internet applications will extend to the Intel-driven Moblin device platform early next year, Intel and Microsoft said on Wednesday. Version 3 of Silverlight will be supported, according to Microsoft. Through Silverlight's cross-platform foundation, developers can write applications once and have them run on both Windows and Moblin devices, Intel said. Moblin is a Linux-based open-source operating system project intended for systems ranging from netbooks and handhelds to smartphones and in-car computers. It is primarily focused on the Intel Atom processor. You have seen visual search in Bing, now here’s another Silverlight based site that might leave your impressed. 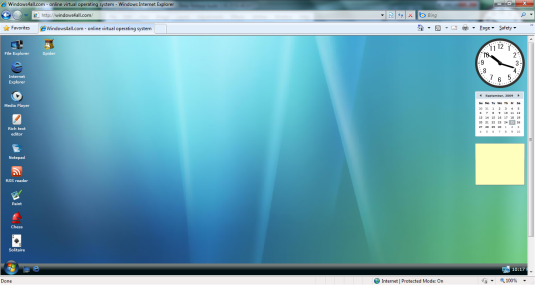 Windows4all not only replicates the look and feel of a freshly installed Windows Vista desktop environment inside your browser but comes with a variety of applications that are similar to the default applications included with Windows. These include Notepad, Windows File Explorer, Media Player, Calculator, Sidebar gadgets and even games like Solitaire and Spider. In many ways, they are right. The fourth generation (the G) of cellphone technology can carry Internet data for smartphones and laptops as much as four times as fast as the current third-generation systems, and within a couple of years, most big carriers in the United States will offer some version of it. For Sprint, getting a head start on introducing 4G may be its best and last chance to repair its position in the market, which has been eroded by the company’s disastrous merger with Nextel and its lapses in customer service. Google's Wave collaboration platform will soon face its first true test when the company rolls it out to 100,000 consumer and business users. Perhaps the biggest mystery is what companies will do to build on top of the Wave platform. British Telecom's Ribbit VOIP arm plans to launch telephony-based gadgets built specifically for the Google Wave platform. Moreover, Google isn't the only company embracing real time for collaboration. Companies such as Etherpad and Watchitoo already offer real-time collaboration. After videotaping truckers behind the wheel, the Virginia Tech Transportation Institute found that those who used on-board computers faced a 10 times greater risk of crashing, nearly crashing or wandering from their lane than truckers who did not use those devices. That figure is lower than the 23 times greater risk when truckers texted, compared with drivers simply focused on the road, according to the same study. However, the Virginia researchers said that truckers tend to use on-board computers more often than they text. The reason why mobile phones are so valuable to people in the poor world is that they are providing access to telecommunications for the very first time, rather than just being portable adjuncts to existing fixed-line phones, as in the rich world. “For you it was incremental—here it’s revolutionary,” says Isaac Nsereko of MTN, Africa’s biggest operator. According to a recent study, adding an extra ten mobile phones per 100 people in a typical developing country boosts growth in GDP per person by 0.8 percentage points. In the grand scheme of telecoms history, mobile phones have made a bigger difference to the lives of more people, more quickly, than any previous technology. They have spread the fastest and proved the easiest and cheapest to adopt. It is now clear that the long process of connecting everyone on Earth to a global telecommunications network, which began with the invention of the telegraph in 1791, is on the verge of being completed. Mobile phones will have done more than anything else to advance the democratisation of telecoms, and all the advantages that come with it. Despite this there are some products and services who purposefully focus on what happens to your data after you die. One such is Legacy Locker, based in San Francisco is run by Jeremy Toeman. For a monthly or lifetime fee you can upload and store all your most personal passwords and documents which are then e-mailed to your pre-chosen contacts should the worst happen to you. And if you are rightly worried about a start up business expiring before you do, Legacy Locker claims that it has set aside enough funding to carry on running the servers for decades to come, even if the company itself stops operating. The full article also references Total Recall, which is on my recommended reading list. When the friendagorilla.org site goes live, users will be able to access videos, pictures and rangers' blogs through websites like Facebook and Twitter, said Moses Mapesa Wafula, head of the Uganda Wildlife Authority (UWA). They will also be able to follow their new friends via satellite tracking. "By paying one dollar to Friend a Gorilla, everybody contributes to the conservation of this species," Wafula said. He's hairy, his table manners are atrocious, and he wants to be your friend on Facebook. No, it's not the ex-boyfriend. It's Muhozi, an endangered Ugandan mountain gorilla, who's appearing online as part of a fundraising program the Ugandan Wildlife Authority launched Saturday to help save the species. Google’s responded to AT&T’s letter in a post to the company blog, pointing out the differences between Google Voice and traditional phone service and questioning AT&T’s motives for appealing to the FCC. But given those limitations, there are still some interesting possibilities. Companies like Facebook or Goodreads could add social features to the Kindle; game developers like Zynga could create nongraphics-intensive games like poker or chess for the device. There could also be educational games, or programs that take advantage of that rarely used keyboard and Kindle’s “experimental” Web browser. AT&T Inc. alleged Friday that Google Inc.'s Google Voice service is improperly preventing consumers from calling certain phone numbers, in violation of federal call-blocking rules. In a letter to the Federal Communications Commission, the phone giant accused Google of violating rules designed to ensure phone companies connect all calls. AT&T also accused Google of violating "net neutrality" principles, which are designed to ensure consumers can use any legal Internet services they want. That Twitter war of words between Jets safety Kerry Rhodes and Rodney Harrison last week? NBC Sports spokesman Brian Walker said yesterday an impostor had set up an account purporting to belong to the former Patriots safety. In his first public comments about the deleted e-mails, Kineavy yesterday said that even though he was double-deleting every day for five years - dragging e-mails to the trash and then emptying the trash - he thought his e-mails still would be saved on city backup servers. Nice spin attempt, but encouraging people to continue using IE6 is, imho, evil -- and blatantly self-serving on Google’s part. What’s next – Google Chrome OS for Windows ME users? "Accessing sites using Google Chrome Frame brings Google Chrome's security features to Internet Explorer users," said a Google spokesman today. "It provides strong phishing and malware protection, absent in IE6, robust sandboxing technology [in IE6 and on Windows XP], and defenses from emerging online threats that are available in days rather than months." This week's quiz is brought to you by yet another Tablet PC rumor, this time courtesy of Microsoft and a gazillion blogs. But that wasn't the only game in town. Dell bet big on global IT services, iPhone upgraders got dealt a bad hand, Netflix tossed a few chips to math geeks for improving its recommendations engine, and the FCC went all in on Net neutrality. Can you bluff your way to a perfect score? Give yourself 10 points for each correct answer. Now shut up and deal. A method, system and computer program product for enlivening conference calls. Noise detectors are placed on the telephone lines for the participants to a conference call. These noise detectors are used to monitor for noise on the telephone lines. A pre-selected stored sound (e.g., an interjection such as a laugh) may be generated if there is a period of silence on one of the telephone lines that exceeds a threshold, if noise is detected on a telephone line associated with a pre-selected individual, or if noise is detected on a pre-selected telephone line. I'm excited to announce that starting today, visitors to Google Books will be able to search and browse even more magazines on Google Books. We've partnered with Life Inc. to digitize LIFE Magazine's entire run as a weekly: over 1,860 issues, covering the years from 1936 to 1972. Most of us are familiar with the term "American Century," but chances are few of us have been able to read Henry Luce's defining editorial in its original context, a 1941 issue of LIFE. You'll be able to find and read Leonard McCombe’s iconic cover and photo essay on a Texas Cowboy and Richard Meryman's famous last interview with Marilyn Monroe. You can find a 1968 cover story on Georgia O'Keeffe (which you may want to read if you're visiting the Whitney Museum anytime soon). A wealthy investor, a university journalism school and a public radio station have joined forces to create a nonprofit local news Web site for the San Francisco area, in what may be the largest and most ambitious of dozens of similar local news operations that have cropped up around the country. Like their counterparts in markets like Chicago, San Diego, Seattle and the Twin Cities, the founders of the Bay Area news project say they want to fill some of the vacuum left by the drastic downsizing of the region’s newspapers. Now the start-up appears to have chalked up another achievement. Twitter, which has no discernible revenue, is set to raise about $100 million of new funding that would value the company at around $1 billion, a person briefed on the company’s plans said Thursday. Microsoft threw down the gauntlet to game rival Sony in the race to develop a challenger to Nintendo’s Wii, saying that most top game publishers were developing products for the US group’s Xbox 360 motion controller. Publishers that accounted for 70 per cent of third-party software sales were making games for the Natal controller, said Don Mattrick, head of Microsoft’s videogame division. Google is rolling out a new service on Wednesday that will allow users to post notes alongside Web sites that can be read by other users. The service, called Sidewiki, will be a new feature of the Google Toolbar, a popular browser add-on. The idea of a service to annotate Web sites has been around for a decade. Back in the Web 1.0 days, a start-up called Third Voice allowed people to post unmoderated comments on sites. After receiving some initial buzz in 1999, the company changed its model a year later and eventually shut down its service altogether in 2001. Some Web site operators complained that the comments were nothing more than Web graffiti. Earlier this summer, Palm filed a complaint with the USB Implementers Forum, an industry group that oversees standards for USB connections, claiming that Apple was restraining trade by only allowing Apple devices to access iTunes, its popular media management software. On Wednesday, the group replied to the letter, dismissing Palm’s assertion that Apple was in violation of its policies. It also said that Palm’s strategy of having its Pre phone masquerade as an iPod so it would work with iTunes was a violation of the group’s membership agreement. Carriers are quickly adding high-speed network capacity, but in the meantime, AT&T and T-Mobile are throwing another lifeline to customers in the form of Wi-Fi. Both are making it easier to connect to wireless hot spots with their phones, in an effort to deliver fast data and clear calls in areas where neither might be possible. In this respect, AT&T has been the most aggressive of any carrier. The company said this month that customers with a Windows Mobile phone could now connect freely at any of the company’s roughly 20,000 hot spots. Preparing for the general launch of Google Wave to 100,000 users next week, Google's Chrome Web browser team today released Google Chrome Frame, an open-source plug-in that enables Chrome's WebKit rendering engine to run in Microsoft's Internet Explorer. On Wednesday, H.P. will take another big step toward full integration of E.D.S., extinguishing the 47-year-old company’s name. The new name, H.P. Enterprise Services, reflects the union of the services operations at the two companies. Always-entertaining Larry Ellison explains how Oracle wants to be (T. J. Watson Sr. era) IBM and how “cloud” is, to him, meaningless. Continuing with the Watson Sr. theme, perhaps Ellison thinks the business world only needs approximately five computers (as Watson Sr. allegedly said in 1943) – really big Oracle Database Machine V2 boxes. Ellison also found time to talk about one of his favorite topics: the phrase cloud computing. A rather loose moniker used to describe just about anything that has to do with the Internet, it’s one of the hottest buzz phrases in the tech industry these days. Ellison dismissed cloud computing as meaningless tech babble a year ago, saying that the tech industry was more prone to adopting the latest fashion than the fashion industry. He reiterated his opposition to the term Monday, asking whether it was true that companies like Google were based on “water vapor.” A video of the riff is available here. A $125 million settlement of a lawsuit that would give Google Inc. the digital rights to millions of out-of-print books will be renegotiated in light of the US Department of Justice’s contention that the deal probably violates antitrust law, lawyers involved in the case said yesterday. "MySQL and Oracle do not compete at all," said Ellison. "If you look at where we compete it's with DB2, Microsoft's SQL Server, Sybase, and a long list of others. We never compete against mySQL, it addresses very different markets." Ellison pointed out that the U.S. Justice Department has already okayed the merger as pro-competition and that once the EU does its job, it will come to the same conclusion. He expressed the need to complete the deal quickly to keep Sun going and to save as many jobs as possible. "The longer this takes, the more money Sun is going to lose," said the CEO. Your best weapon in most computer science problems is caching. But if, like the Facebook home page, it's basically updating every minute or less than a minute, then pretty much every time I load it, it's a new page, or at least has new content. That kind of throws the whole caching idea out the window. Doing things in or near real time puts a lot of pressure on the system because the live-ness or freshness of the data requires you to query more in real time. We've built a couple systems behind that. One of them is a custom in-memory database that keeps track of what's happening in your friends network and is able to return the core set of results very quickly, much more quickly than having to go and touch a database, for example. And then we have a lot of novel system architecture around how to shard and split out all of this data. There's too much data updated too fast to stick it in a big central database. That doesn't work. So we have to separate it out, split it out, to thousands of databases, and then be able to query those databases at high speed. "The longer this takes, the more money Sun is going to lose," Ellison said on Monday evening during a dinner at one of Silicon Valley's most prominent speaker's forums, the Churchill Club. Since starting the company in 1997, Hastings' goal has always been the same: to deliver the right content in the fastest and most economical way. Obsessed with designing the perfect algorithm for helping viewers discover new movies, he has packed the place with mathematicians and engineers. They test everything, from the recommendations engine to the Web site's design. But if Hastings uses geeky number-crunching to help customers find their movies, his process of delivering them has been decidedly low tech: sending DVDs in red envelopes via the US Postal Service, which costs him roughly a quarter of his $1.4 billion in annual revenue. Indeed, since it began in October 2006, the Netflix contest was significant less for the prize money than as a test case for new ideas about how to efficiently foster innovation in the Internet era — notably, offering prizes as an incentive and encouraging online collaboration to tap minds worldwide. The lessons of the Netflix contest could extend well beyond improving movie picks. The researchers from around the world were grappling with a huge data set — 100 million movie ratings — and the challenges of large-scale modeling, which can be applied across the fields of science, commerce and politics. "What I hope is that people start understanding if you're getting your newspaper over the Internet, that's not free and there's got to be a way to find a business model that supports that." Newspaper ad revenues continue to fall and at a pace not seen since the Depression. The New York Times reports that Q3 ad revenues are expected to be 25% below the same period a year ago. The drop in combined print and digital ad revenue last year, 16.6 percent, according to the Newspaper Association of America, was the worst since the Depression. But it looks rosy next to 2009, when revenue fell 28.3 percent in the first quarter and 29 percent in the second. Foremski's Take: This is bad news for newspaper companies because they have already made many cuts in staff and other expenses. There isn't much more they can do. Within several months, viewers in Germany with specially equipped televisions may be able to watch public broadcasters’ Internet television services, which let users catch up on the shows of the previous week, whenever they choose, via their computers. In Britain, the BBC and several partners are working on a more ambitious project to bring what is called catch-up TV and a variety of other programming and interactive services to television sets as soon as next year. Here’s where it gets interesting. The PRA was written in 1978. It doesn’t have a section on email. But everyone agrees that these electronic communications meet the Act’s broad definition of presidential records, and that the White House is legally required to preserve them. The emergence of social media has created new forms of communication. Instead of sending an email, people often now post on someone’s profile or comment on a video or photo that's been uploaded. When people want to tell the White House what they think, they’ll often do the same thing on our social media pages. A lot of times, we solicit this feedback because we want to hear from you. These new types of communications from individuals to the White House, even though they take a different form, are governed by the PRA. Working with NARA, we’ve concluded that comments and messages the White House receives on its official pages are presidential records. That means the PRA requires us, by law, to preserve them. Users of Google Docs and Spreadsheets accustomed to publicly publishing their documents might want to rethink exactly how publicly available they want to them to be. Google on Thursday wrote in a blog post that "in about two weeks, we will be launching a change for published docs. The change will allow published docs that are linked to from a public Web site to be crawled and indexed, which means they can appear in search results you see on Google.com and other search engines...This is a very exciting change as your published docs linked to from public websites will reach a much wider audience of people." Hmm – CueCat done right? A Microsoft Tag is a new type of bar code, optimized for reading on mobile phones, with symbols that can form trillions of combinations. And that’s what gives Tag its power. When a consumer downloads the Microsoft Tag application and then snaps a picture of a Tag, the application performs an action, such as opening a Web browser and taking the consumer to a URL or dialing a phone number. Consumers can receive multimedia information, discount coupons, purchase options—virtually any consumer marketing or sales activity. Consumers can also make their own Tags, linking them to their Facebook pages or simply sharing their contact information in a new and fun way. The Tags can be small enough— as small as the size of a dime—to be used nearly anywhere in an ad or other marketing material. And because their colorful appearance can include a company logo, Tags can fit into posters, billboards, brochures, display ads, point-of-purchase displays, catalogs, and more. Microsoft Tag Gives Consumers a New Way to Gain Information, Take Action from Mobile Phones: Microsoft Tag technology is an updated mobile bar code that turns phones into marketing devices for publishers, retailers, consumer goods makers, and the hospitality industry. Indeed, Amazon has been gobbling e-commerce market share since 2006, taking away customers from eBay in particular. But its advances are shaking up the entire retail world. Giants like Wal-Mart are warily replicating elements of its strategy, while small independent retailers in sporting goods and jewelry now worry their fate will be similar to that of small bookstores and independent video rental shops (remember those?). Amazon’s expansion strategy has allowed it, almost alone among retailers, to thrive during the recession, even while its own media business has stagnated. Over the last year, shoppers have bought fewer books, CDs and DVDs, in many cases opting for cheaper digital downloads. In the quarter ending in June, for example, Amazon’s worldwide media sales grew only 1 percent, to $2.4 billion, highlighted by a slowdown in video games. But during the same quarter, sales of other products, which the company lumps together on its balance sheet in a grouping dubbed “electronics and general merchandise,” grew by 35 percent, to $2.07 billion. To anyone who has dealt with Oracle on any matter of import for the past decade, it makes perfect sense that Schwartz would appeal to Catz, who shares the president's title with onetime research analyst Charles Phillips. Yet Catz, a 47-year-old former investment banker, is nearly unknown in the broader business world -- and she is something of a mystery even within Oracle. Many of the executives she oversees know next to nothing about her. She shuns the limelight assiduously: Oracle's own marketing department once struggled to persuade her to be photographed. The low profile masks her high impact. "Make no mistake," says a prominent tech industry CEO. "She's running the company, not Charles Phillips. When Larry and I are discussing something that goes beyond us, out comes the cellphone, and Safra is on the other end." The $249 DreamScreen 100 is a 10.2-inch display that would be right at home on your bedroom nightstand (it has a built-in world clock radio and calendar). The Wi-Fi-enabled device also displays a five-day weather forecast so you know what to expect outdoors before you get out of bed (or in the case of very bad weather, not). The Justice Department said it was concerned that the agreement could violate antitrust law by giving book publishers the ability to “restrict price competition” and by giving Google “de facto exclusive rights for the digital distribution of orphan works.” Orphan works are books whose authors are unknown or cannot be found. Google dropped its request for confidentiality in the manner concerning the rejection of Google Voice from the App Store in July, and directly contradicted Apple's version of events Friday. In the letter (click for PDF), Google said Apple Senior Vice President of Worldwide Marketing Phil Schiller informed Google that the app had, in fact, been rejected, when Apple's public statements to the FCC in that month claimed it was merely still under review. Ellison launched Pillar in 2005 after four years of development and $150 million from his investment firm, Tako Ventures LLC. Ellison positioned Pillar as a legally separate business from Oracle aimed at competing with storage heavyweights such as IBM, EMC Corp. and Hewlett-Packard Co.
"Larry has made it clear he's going after the server market, and storage is a part of that. Larry is not going to take that [HDS] deal with him [when the merger closes]," [ Bob Mannes, vice president of worldwide marketing and channel sales at Pillar] said. "We're excited about the ... opportunities of the whole Oracle-Sun deal. We'll have an opportunity to participate in that data center stack. We have better products than Sun. We will have a go-to-market outlet that we didn't have prior to this. "Larry knows how to monetize technology," he added. Pillar Data storage could be resold by Oracle's Sun hardware unit in an Oracle-Sun-Pillar combination, threatening Sun's existing HDS OEM deal. Pillar's Axiom array scales to 1.6PB of tiered storage which can be tuned to deliver different quality of storage service levels to applications. The company is a start-up run by Dr Mike Workman and funded by one venture capital firm, Tako Ventures, owned by Oracle boss Larry Ellison. Previously a Pillar source has suggested that Oracle could buy Pillar and combine it with Sun's storage operations. Either way Pillar would enjoy a greatly increased access to the market, and also access to possibly increased engineering resources. Google will probably protest that the patent they filed on reading lists was defensive. But it's a bad patent, based on an "invention" that was already out there, being discussed openly on Scripting News at least a year before they filed it. If you can subscribe to a feed, why not subscribe to a collection of feeds? And when an item is removed, you no longer are subscribed to it, and when one is added, you are now subscribed to it. Last week, I returned to using Windows 7 after spending the summer on a 13-inch MacBook Pro. Apple almost had me there for awhile, but I'm back where I belong and satisfied with the switch. Given that Apple released Snow Leopard a couple of weeks ago, Windows 7 officially launches October 22nd and there is plenty of geek debate about which OS is better, it's appropriate time to tell the story about how I went -- in the words of J.R.R. Tolkien -- "there and back again." Windows 7 performance is excellent, and resume-from-sleep time is about as fast as Snow Leopard. I've no complaints and lots of satisfaction for the switch. For anyone holding back because of Vista, Windows 7 is for you. For anyone considering switching to a Mac, wait to see what new designs PC manufacturers release with Windows 7. You might be surprised just how cool they can be. Gulp, here it comes. I'm a PC, and why aren't you? Based on reader comments, I know many are college and university students. I figured I would take a moment to highlight a great deal for those folks we’ve announced today. For a limited time, we are offering the LOWEST PRICE ($29.99 in the US) for Windows 7 exclusively to college and university students. This offer is perfect for students who are not planning to buy a new PC but want to experience all the benefits that Windows 7 will provide. To learn more about the offer and to check eligibility, students should visit www.Win741.com. Some Google-watchers see a much bigger challenge. “Google has been masterful at coming up with a lot of ideas, but none of them has matured to become something that moves the revenue needle,” says Gene Munster of Piper Jaffray, an investment bank. In fairness to the company, that is partly because many of its popular innovations, such as Gmail, have been given away to boost search-related advertising, which accounts for almost all of Google’s revenues. But search has been suffering in the downturn: in the second quarter of 2009 Google’s revenues were $5.5 billion, barely 3% higher than the same period in 2008. Time, then, for the company to find new ideas that can make a big splash. Google’s path to the display advertising business has been tortuous. The company began tackling the market years ago. Unable to make serious headway, it bought DoubleClick, and since the deal closed more than a year ago, Google has been integrating DoubleClick’s technology with its own advertising systems. Mr. Mohan said that the new ad exchange was a major milestone in that integration. Yet in the last few months, Google has also lost a number of advertising executives, including David Rosenblatt, the former chief executive of DoubleClick, who was president of display advertising for Google. Michael Rubenstein, who oversaw the original DoubleClick ad exchange, also left recently to join a start-up. Microsoft Corp. said it filed five lawsuits against alleged purveyors of "malvertisements" -- online advertisements that dupe unsuspecting users into downloading malicious software on their computers. The Redmond, Wash., company filed the lawsuits Thursday in Washington state court in Seattle. The suits cite anonymous defendants using the business names Direct Ad Solutions, Soft Solutions Inc., Qiweroqw.com, ITmeter Inc. and ote2008.info, alleging that they used Microsoft's system for posting online ads to attract users to sites that attempted to install malicious software on their PCs. Check the full article for more Oracle Database Machine V1 => V2 details. Tangential projection: I won’t be surprised to see Teradata acquired sometime over the next few months, perhaps by HP – or Cisco. Just how hacked off at Hewlett-Packard (NYSE: HPQ) is Oracle CEO Larry Ellison? He's so furious that he's dumping HP as the hardware partner for what he's called Oracle's "most successful introduction ever" that's triggered the biggest new-product sales pipeline the company's ever seen. Ellison, after getting hammered relentlessly for months by HP and IBM as they ravaged Sun's customer base and cost Oracle (NSDQ: ORCL) many tens of millions of dollars, has begun swinging back in the past week against both companies but has aimed his most-aggressive punch at HP by dropping it as the hardware supplier for the sophisticated Exadata database machine. Mr. Ahn calls this “human computation” — using human brainpower to help computers solve problems they can’t solve on their own. The New York Times, for one, has used ReCaptcha to help scan its 150-years-deep archives. And Google has worked with Mr. Ahn before to harness human intelligence, with its Image Labeler, a game in which Internet users compete to add descriptive tags to photographs, which ends up making those photos more identifiable and searchable in Google’s index. Now Google recognizes that humans might help in its vast and controversial Google Book Search project. It has been scanning old books from libraries for more than five years and runs character recognition software on those scans to convert them to plain text, so they can be easily searched and displayed on mobile devices. The next time you solve a captcha puzzle to log into a Web site, you may be helping that effort. The idea behind a captcha is to confuse a computer, but computers are also confused by some words written in fonts used long ago. ReCaptcha offers two words, one of which is a captcha it already knows, and one of which is a word it doesn't know. The thinking is that if you get the first word right, you're likely a human and you're also probably going to get the second one right. It can then pool all the answers for the second word and declare with a reasonable amount of certainty that the second word is what most people think it is, thereby updating the vocabulary of participating book scanners. This is of obvious interest to Google, currently bent on scanning as many books as it can find. Google CEO Eric Schmidt expressed frustration with the critics of the settlement earlier today in an interview with Search Engine Land's Danny Sullivan, complaining that those criticizing the settlement aren't putting forward their own solutions to create what all parties to the settlement agree would be a tremendous asset: a comprehensive digital library. "I'm open to a better solution," Schmidt told Search Engine Land. "You will recall, we had our solution, and we were sued over it. And we then had a-god-knows-how-many years of negotiations with 27 parties, and we've actually produced a deal," he said. In the court filing, Joltid, a company owned by the Skype founders, claims that eBay violated copyright law by altering and sharing the peer-to-peer source code behind the free Internet calling service. The Skype founders maintained ownership of that source code after selling Skype to eBay in 2005, and licensed it to eBay. Joltid seeks an injunction and statutory damages, which it says could total more than $75 million a day. The lawsuit also names as defendants Silver Lake Partners and its partners in the buyout, Index Ventures, Andreessen Horowitz and the Canada Pension Plan Investment Board. During the last few weeks, I’ve been using a slate of programs to tame these digital distractions. The apps break down into three broad categories. The most innocuous simply try to monitor my online habits in an effort to shame me into working more productively. Others reduce visual bells and whistles on my desktop as a way to keep me focused. And then there are the apps that really mean business — they let me actively block various parts of the Internet so that when my mind strays, I’m prohibited from giving in to my shiftless ways. It’s the digital equivalent of dieting by locking up the refrigerator and throwing away the key. "Google has the default search box in [Apple] Safari and in [Mozilla] Firefox. Instead of partnering with these companies and claiming the parts of the browsing experience that make money, Google is doing its best to alienate these organizations to claim browser share," Gartenberg said. "I am not sure why and what they are hoping to accomplish here." Gartenberg said Chrome gives him the feeling that Google created a browser for the sake of creating a browser. In the long run, he's not sure Chrome will further Google's ambitions in the manner Google is expecting. "Chrome doesn't bring any revenues in and of itself. They are certainly not selling the browser. You do have to wonder: If Google is going to start alienating its partners, like Mozilla and Apple, is this a good opportunity for Microsoft?" Gartenberg said. "One does have to question if this is really the business Google wants to be in." The Slatest - Obama Calls Kanye West a "Jackass"